On 21st April on a lovely sunny morning, the whole school gathered to celebrate the 10th Anniversary of our school. The occasion was marked with speeches by students, Instructional Mentor and Principal of the school. NH Goel World School started its journey in 2008 to fulfill the long cherished dream to create world citizens with humane values by facilitating learning in a progressive and inclusive ambience and to enhance the inherent potential of all the stake holders. It has come a long way in developing a learning environment and curriculum. It has been appreciated by parents of children and the school has grown significantly over the years and today has a healthy enrollment of over 1650 students. NH Goel World School has forged ahead to strengthen its CBSE as well as IGCSE curriculum and put in place a holistic education of core values. The management extended heartiest congratulations and best wishes to the students, staff and all stakeholders on the occasion of 10th anniversary. The Managing Director Shri Rajendra Goel during his address emphasised on the value of time and to make judicious use of each and every moment to be a successful person in life. The Director of the school Kalpana Chaudhary stressed on the philosophy of love and perseverance - one that is student centric and has transformed and nurtured the lives of many students. She wished many more fruitful and successful years ahead. Teachers and support staff who had joined the school is in its first year were felicitated by the management. Principal & Head of School Dr.M.V. 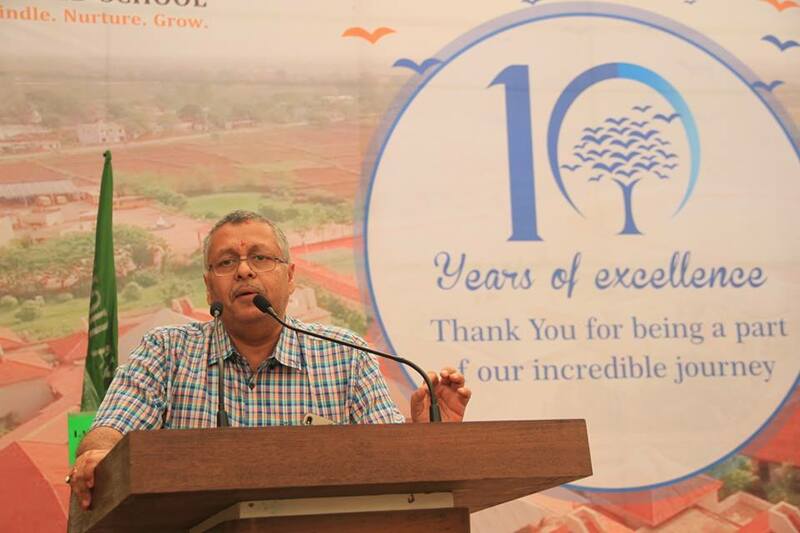 Krishnamachari congratulated all on this special occasion and highlighted the contributions of the management, parents, teachers, students, other staff and all the stakeholders for the progress of the school for the last 10 years and proposed the vote of thanks. He also wished many more great accomplishments and achievements for the students and for the bright future of the school. The students also planted a tree to commemorate the event and has buried a Time Capsule with previous issues of Milestone (the school magazine) along with some thoughts penned by the students and teachers. They plan to open the Time Capsule on the 20th Anniversary of the School.